I mentioned yesterday that there only were 8 pattern pieces? Yes, that is right, but all of them are duplicated made as lining as well. Oh, well. 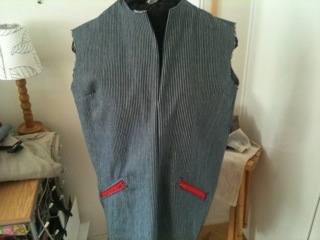 I’ve cut our evereything and most of yesterday’s sewing time went to make the pockets. 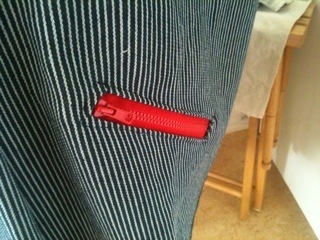 They are constructed as welt pockets, byt with a zipper insert. The instructions were quite clear, though and they went together surprisingly well. Today’s task: attatch the hood, sleeves and front zipper. WOW! Looking good!! Hope your headache goes away soon! Looks nice and spring-like! Sewing is good for taking your mind of things like headaches! Those zippers look great! I hope you feel better. Ooh, those zippered pockets look fantastic!